I am a student, currently in my second year, and have opted to start volunteering for a variety of opportunities advertised by the Students Union, to help me meet new people and engage with new activities. The weather leading up to the day was very mixed and with this in mind I still chose to sign up. The details given on the website were basic, informing of the tasks to be expected on the day. Once you’ve signed up, a confirmation email was received informing of further details of what we would be doing for the day. We were requested to meet at Gateway for 9am on the Saturday morning. From waking up to very unsettling weather, I failed to let this stop me from going. The day started well with beautiful scenery surrounding us as we set about working. When we first arrived, we ventured on a ten-minute walk to the site and received a full health and safety talk and met the team we were working with. The two rangers provided us with the equipment needed as well as gardening gloves and old coats to protect us from possible sparks. From talking with them, they informed us that certain sites were being opened up to grassland to allow species to nest here. Multiple sites around the area had been chosen to allow for variance in different habitats. 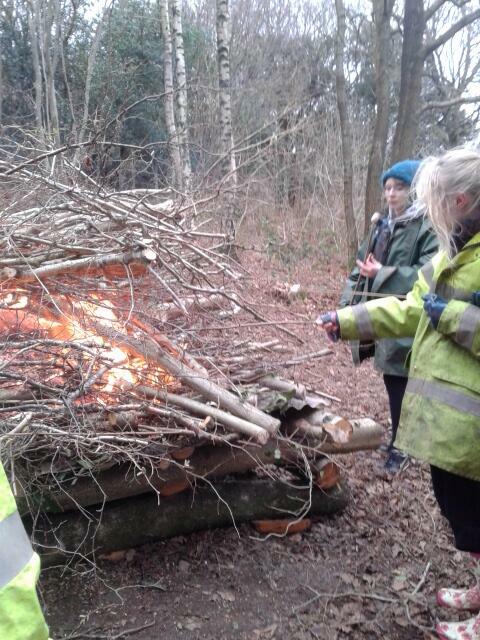 Our main task for the day was to cut branches, using either saws or loppers and place on the bonfire we were building as the day went on. As the day progressed, we were hopeful that the weather was on our side, remaining dry for the majority of our time there. Whilst having lunch we all sat round the fire to keep warm. Toward the end of the day, we were rewarded with toasting marshmallows on the bonfire, which was definitely a highlight to the day! Overall, I really enjoyed the day because it allowed me to experience being outdoors more and visit areas close to Lancaster I would never have seen, otherwise. I would highly recommend taking advantage of the different volunteering opportunities the SU offers.